Microsoft recently announced the released of Identity and Access Tool for Visual Studio 2012 that enables you to secure ASP.NET, ASP.NET MVC and WCF services with claims based identity. It also provides an ability to accept users from multiple identity providers and adds the necessary configuration for the selected identity provider. The extension works by updating web.config file with the required settings to enable the Windows Identity Foundation and includes a code generation module that generate a discovery page. Right click on the project name from the Solution Explorer and provide the required values on the Identity and Access dialog. 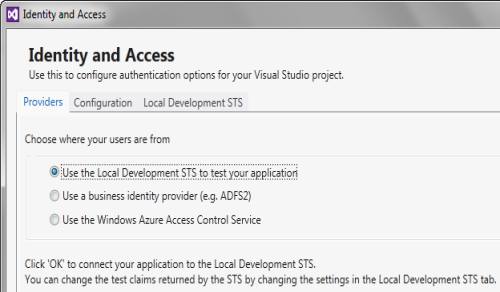 Identity and Access Tool enables you to develop and test applications using a local development STS, corporate identity provider like ADFS2 via HTTPS including the usage of Windows Azure Access Control Service to connect to other identity providers such as LiveID, Google, Yahoo and Facebook.